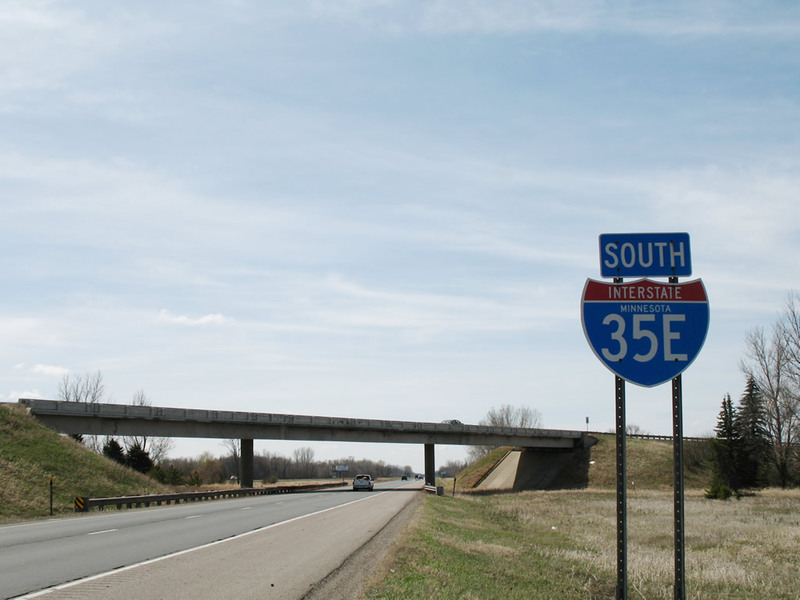 Interstate 35 separates into eastern and western branches through the Twin Cities between Burnsville and Lino Lakes in Anoka County. 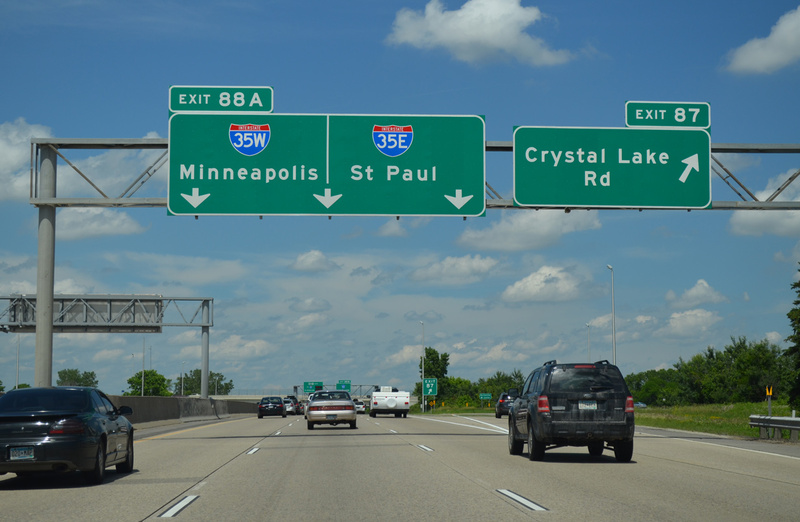 I-35W leads north to Bloomington and Minneapolis while I-35E travels northeast through to Eagan, Mendota Heights and St. Paul. 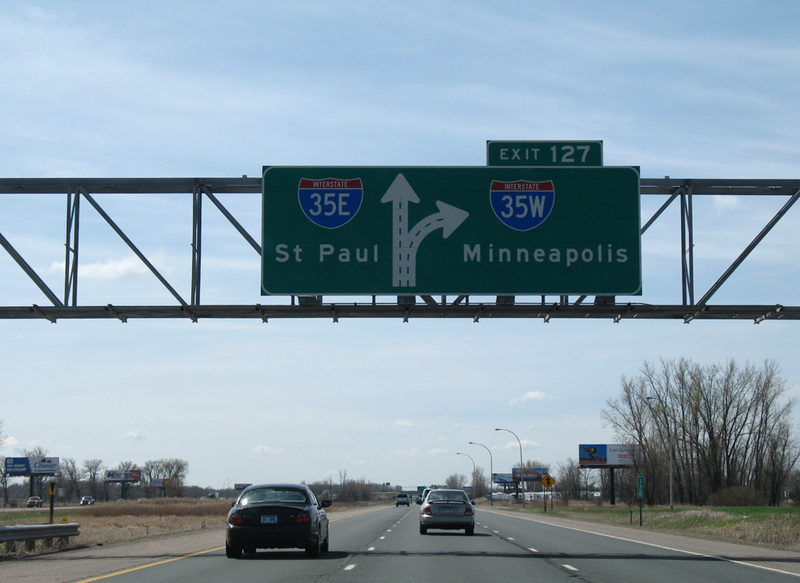 Interstate 35E continues the exit numbering system of I-35 through the St. Paul area. The freeway winds northward through Lilydale and across the Mississippi River to enter south Saint Paul at the Crosby Nature Area. An ess curve takes the freeway eastward onto a parkway section ahead of Downtown. The portion of I-35E between MN 5 and I-94 includes a truck prohibition (over 9,000 pounds) due to the parkway status of the route. 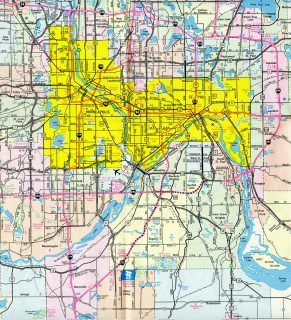 Once in Downtown St. Paul, Interstate 35E briefly commingles with Interstate 94 & U.S. 12-52 before again curving northward to Maplewood. 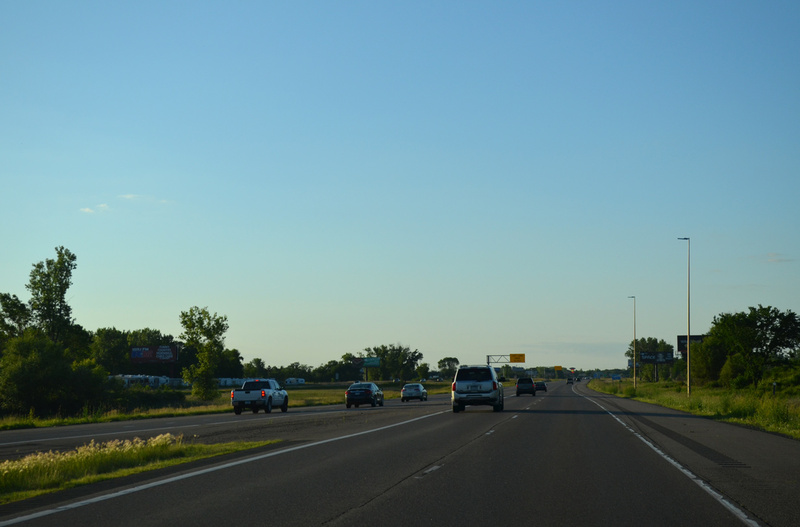 A due north trajectory takes the route to Little Canada and a dog leg along side Interstate 694 to Vadnais Heights. The remainder of I-35E travels northward to White Bear Lake, White Bear Township, North Oaks and Lino Lakes. A rural end point lies north of Centerville, with I-35W merging into I-35E from the left. 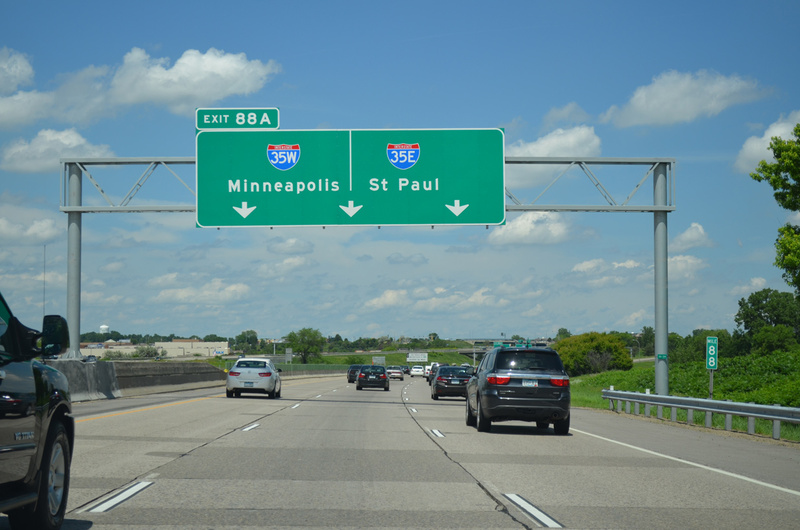 Interstate 35E combines with U.S. 10 from Downtown St. Paul to Interstate 694 while paralleling U.S. 61 to the west from St. Paul north to Columbus. Initial construction on the parkway section of Interstate 35E ran northward from Minnesota 5 (West 7th Street) to the Linwood Park vicinity in 1980. The route however would not open for another ten years. The Parkway section of I-35E defaults northbound motorists onto I-94 east while access to I-35E southbound is only available directly from I-94 west. Local streets are required to make the missing connections. 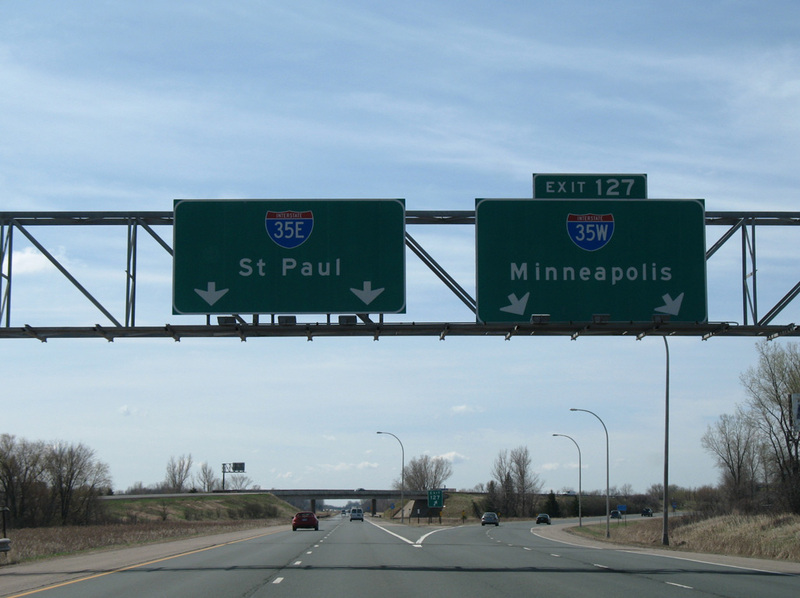 Interstate 35E was the last Minneapolis-St. Paul area Interstate to be completed. Delays due to litigation and compromise pushed the final four mile segment of I-35E back to an opening on October 15, 1990, 19 years after work started. 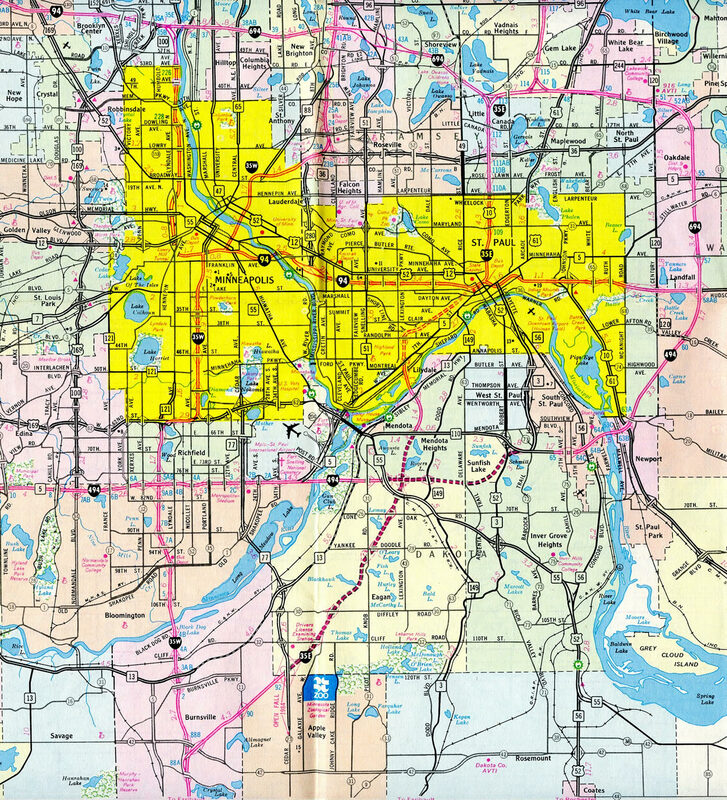 This stretch through the West Seventh area runs northeast from south St. Paul to Interstate 94 in Downtown. I-35E through south St. Paul was first envisioned in 1920 and planned more formerly as a six-lane freeway known as the Pleasant Avenue corridor in 1955. Initial work on the route was halted in 1972, after only a year of progress. During that time, area residents formed a citizens group against the highway known as RIP-35E, for “Residents In Protest”, complete with a tombstone symbol for the road. 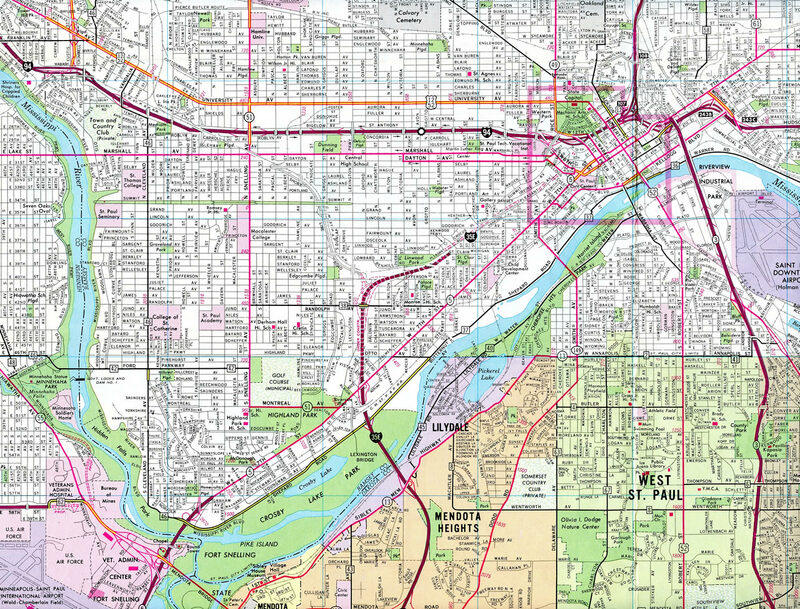 Their efforts led to political action at both city and state levels, resulting in an extensive reevaluation of the freeway plans. A plan to construct a parkway in place of a high-speed freeway was nearly reached, when labor unions gave their input and swayed the opinions of public officials. The prior plan did not include a direct connection with I-94, but the new plan did. This resulted in a law suit filed by RIP-35E in March 1983 over the connection issue, which the group contended was sufficient using city streets to continue northward along I-35E beyond Downtown. A federal judge disagreed and ruled against RIP on February 9, 1984, allowing for the direction connection. 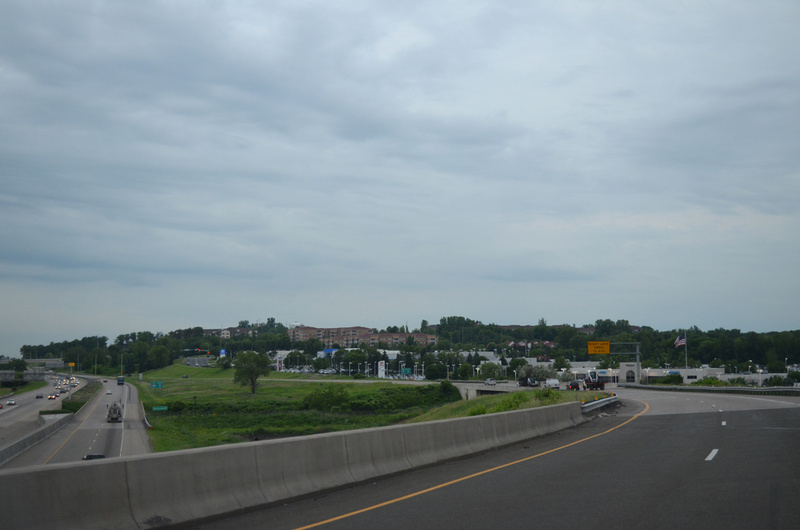 By 1964 – the first stretch of I-35E is open from Maryland Avenue north to I-694 west at Little Canada. 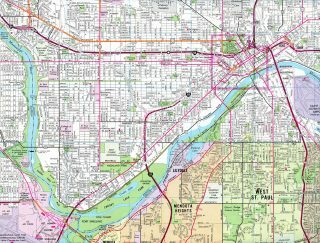 1965 – I-35E is under construction from MN 110 to MN 5 and from Maryland Avenue south to Downtown St. Paul and from the Lino Lakes south city northward. 1971 – I-35E north from I-694 and Vadnais Heights to I-35W at Columbus. 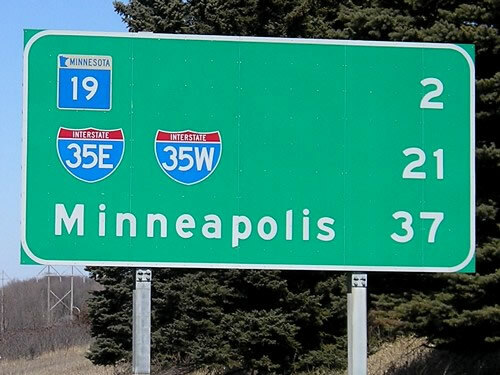 By 1983 Interstate 35E was open from Burnsville north to Minnesota 77 at Eagan, with the portion north from there to Minnesota 110 at Mendota Heights under construction. The last northbound shield for Interstate 35E appears along a rural stretch leading away from Centerville. Photo taken 06/15/15. Similar to the north approach of I-35W, an end sign advises motorists of the impending transition of Interstate 35E to I-35 north. Photo taken 06/15/15. 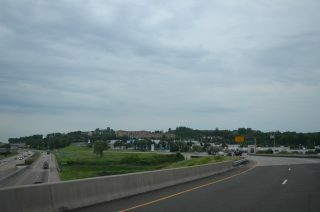 Just north of the Lino Lakes city line, Interstate 35E enters the wye interchange with Interstate 35W. Photo taken 06/15/15. Diagrammatic signs for Interstates 35E-W posted on southbound I-35 were replaced by 2011. Exit 127 is used for I-35W, while the exit numbering for I-35 continues along I-35E. Photos taken 04/23/07. Former overheads posted at Exit 127 on I-35 south. Cardinal direction indicators were omitted. Photo taken 04/23/07. 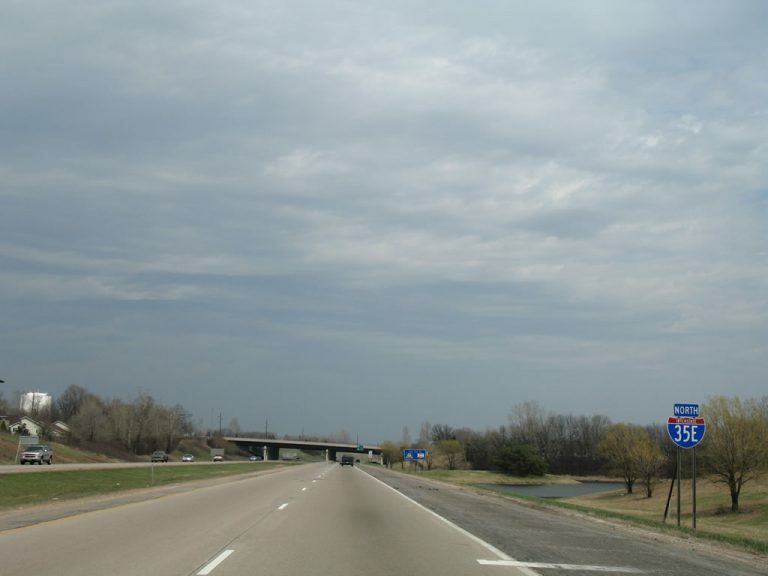 This state-named shield was the first reassurance marker for I-35E south. 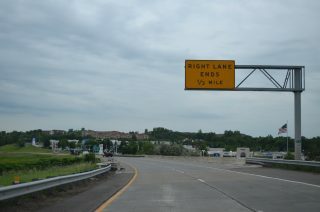 It was replaced by 2008 and stood just ahead of the overpass carrying I-35W north onto I-35. Photo taken 04/23/07. 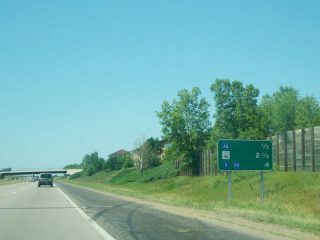 The final exit along I-35E connects with Dakota County Road 42 in Burnsville. Photo taken by Chris Lokken (07/13/06). 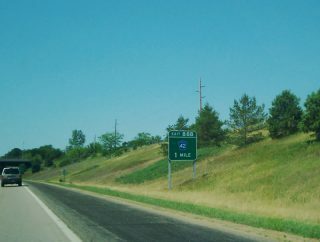 CR 46 lies two miles further along the resumption of Interstate 35 south. There is no access otherwise to I-35W north through Burnsville from I-35E south. CR 42 however connects the two via adjacent interchanges. Photo taken by Chris Lokken (07/13/06). 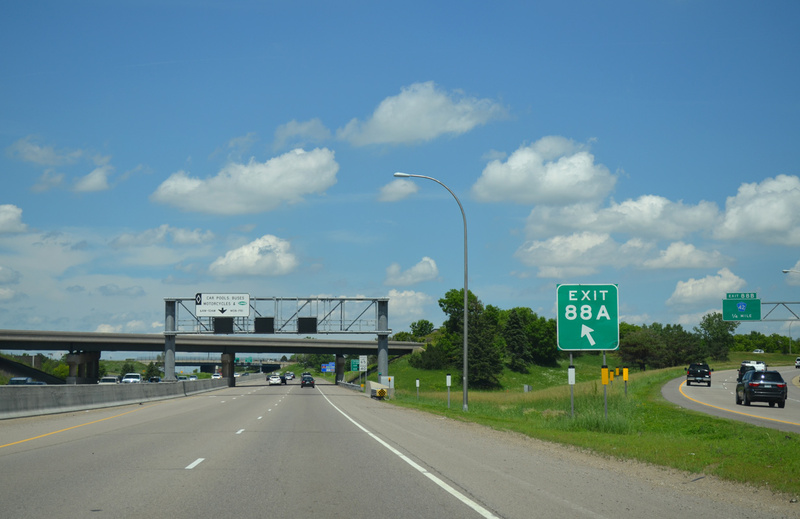 Exit 88B departs Interstate 35E south for County Road 42 west to Burnsville Center mall and east to 150th Street through Apple Valley. Motorists continuing south default onto I-35 ahead. Photo taken 06/15/15. 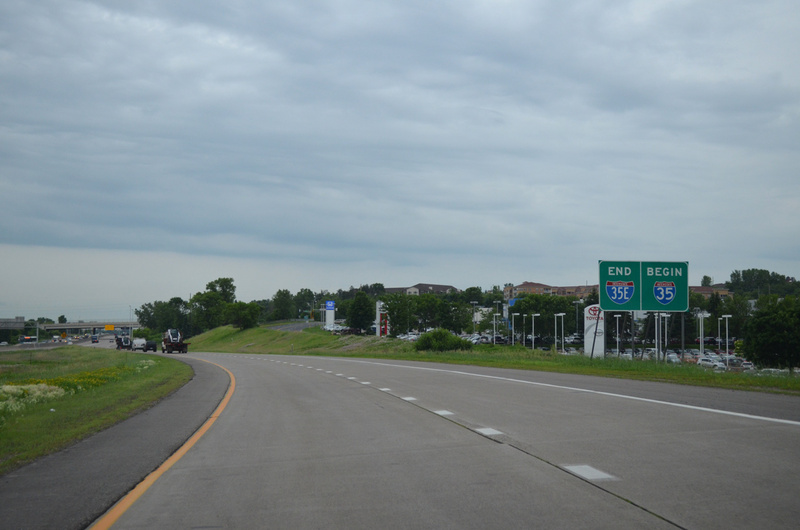 Entering the wye interchange, Interstate 35E sweeps westward to merge onto I-35W. Southcross Drive passes below the exchange from adjacent suburban areas. Photo taken 06/15/15. Drivers taking the two-lane ramp from I-35E onto I-35W quickly face a lane drop at the 150th Street overpass. Photo taken 06/15/15. 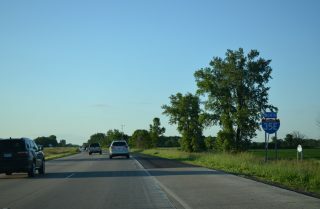 A formal end sign references the transition back into Interstate 35. I-35 splits again 931 miles to the south at Denton, Texas. Photo taken 06/15/15. 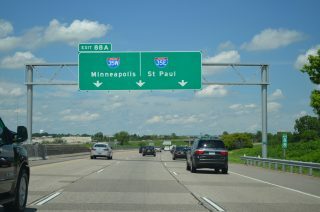 The I-35E/I-35W separation appears along Interstate 35 north, 21 miles to the south ahead of Exit 69 for Minnesota 19 near Northfield. Photo taken by Jeff Morrison (03/19/07). Three lanes of Interstate 35 north continue beyond Crystal Lake Road (Exit 87) to the split of I-35E/I-35W at Exit 88A. 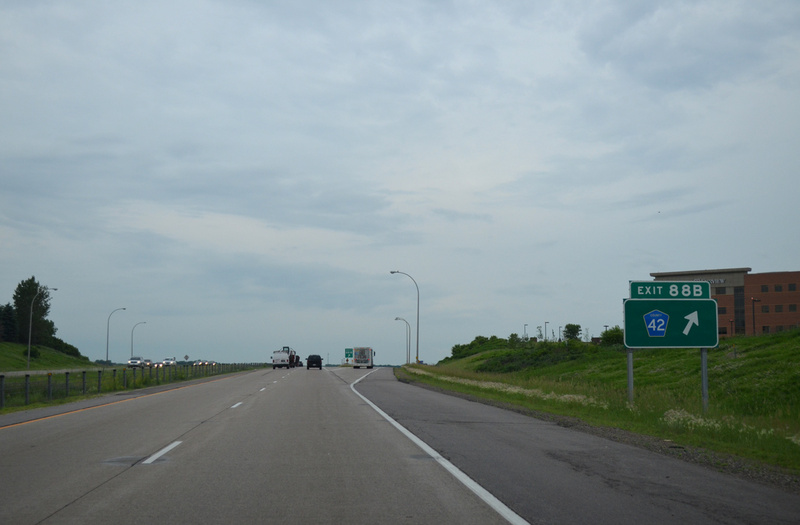 The mileposts and exit numbering of I-35 continues along I-35E. Photo taken 06/14/15. 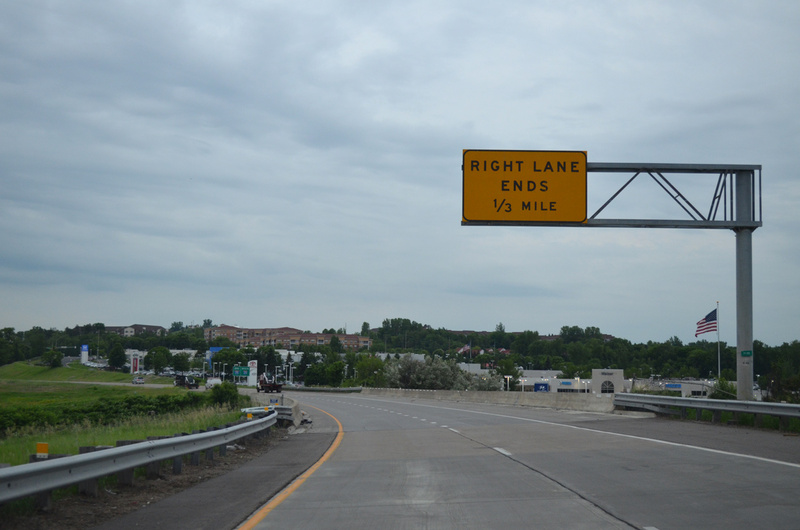 Lane control signals and a variable toll rate sign at Crystal Lake Road for the MnPASS lanes along I-35W. 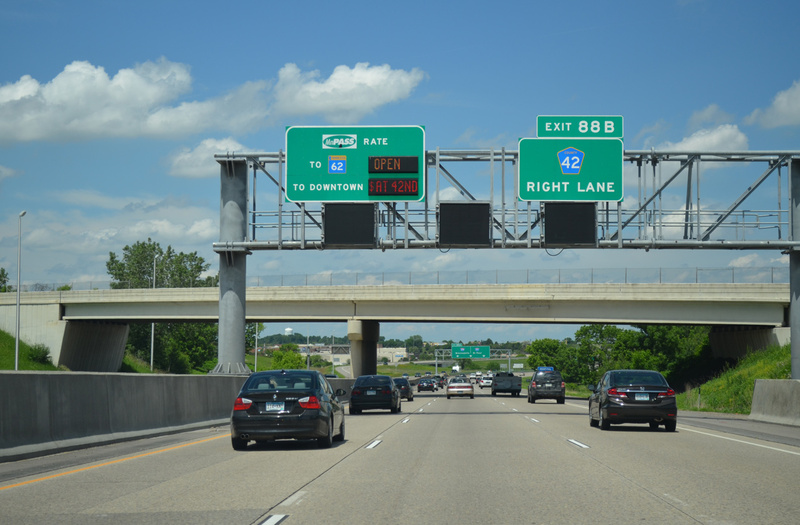 The Express toll lanes run north along the innermost lane of I-35W to Downtown Minneapolis. Photo taken 06/14/15. Interstate 35E angles northeast to Apple Valley, Eagan and Mendota Heights while I-35W maintains a northward heading through Burnsville, Bloomington and Richfield. Photo taken 06/14/15. 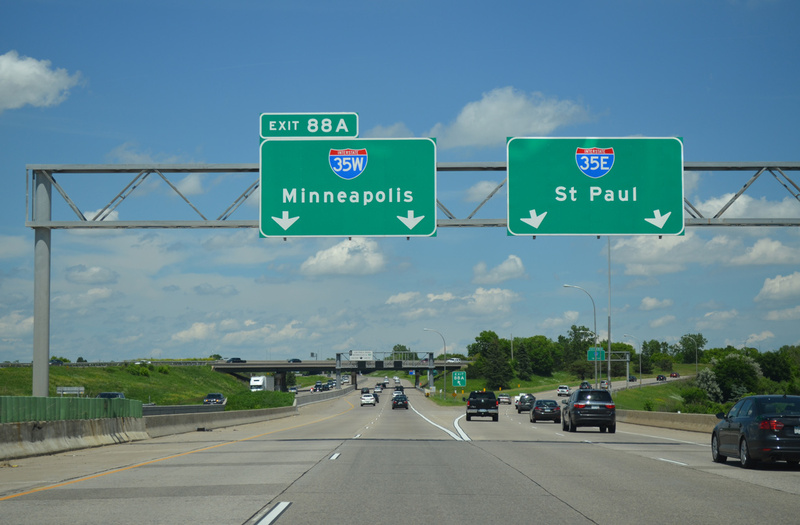 Travelers separate into Interstate 35W north to Minneapolis and Interstate 35E northeast to Saint Paul. Photo taken 06/14/15. 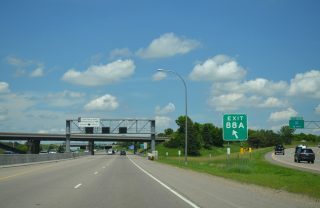 Just beyond the separation, the MnPASS lane begins on I-35W while Exit 88B departs from I-35E for County Road 42 to south Burnsville and Burnsville Center mall. Photo taken 06/14/15. The first reassurance marker for Interstate 35E stands between the Portland Avenue and McAndrews Road overpasses ahead of Exit 90 for Apple Valley. Photo taken 04/21/07. 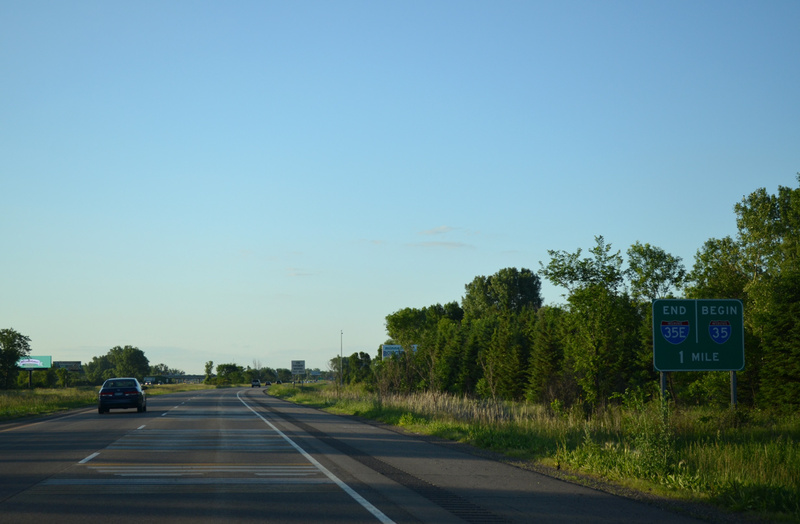 “MnPASS lanes open on I-35E.” Pioneer Press, November 29, 2015. “North, South Legs Of I-35E Will Finally Be Connected.” St. Paul Pioneer Press (MN), October 7, 1990. I-35E South Metro (outside the Beltway), Adam Froehlig.